Gloria is a nationally renowned Anmatyerre artist from the tiny community of Boundary Bore in the Utopia Homelands, Central Australia. She was one of the original participants in the Utopia Batik project and in 1990 she traveled to Ireland, London and India as a representative of the Utopia Women in the 'Utopia - A Picture Story' exhibition. 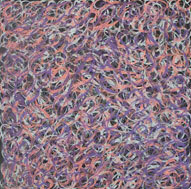 In 1991, Gloria had her first solo exhibition and in 1999 she was awarded the Wynn Prize for landscape painting through the Art Gallery of New South Wales. 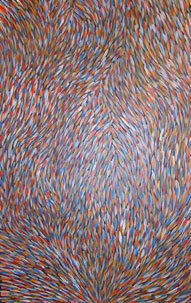 Her works are held in numerous prestigious collections including the National Gallery of Australia, Canberra, the National Gallery of Victoria, Melbourne and the Art Gallery of New South Wales, Sydney. 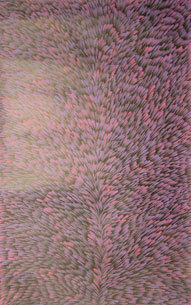 In a relatively recent departure from Awelye or ceremonial body paint designs, Gloria now focuses on "Bush Medicine Leaves" as the subject matter for most of her paintings. The Bush Medicine plant is a native bush of the Eremophila family whose leaves have natural antiseptic properties. The leaves of the Bush Medicine plant are still commonly gathered and boiled to extract a resin which can be mixed with animal fat to create an ointment for use in the treatment of cuts and abrasions, the mixture can also be ingested orally. The Bush Medicine plant is one of Gloria's totems (the mountain devil lizard being another), therefore it is her role to pay homage to these totems in song and dance during ceremonies and of course through painting, whether it be through the impermanence of ceremonial body paint or the more lasting medium of artists acrylic on stretched canvas or linen.